professor of computer science at Carnegie Mellon University and at the University of Delaware. He helped design parts of the Internet, and he has also served as the chief technologist at the FCC. Farber is sometimes called the "Grandfather of the Internet" both because of his pioneering work in distributed computing and his mentoring of graduate students who helped build the Internet. He remains deeply involved in debates over how to maximize benefits and minimize risks of the Internet. David & GG Farber Societal Impact Award in 2003, a prize annually conferred upon a Stevens graduating senior. In June 2012, Farber doubled the amount of funding available for the award with a second $50,000 contribution. 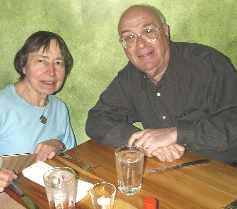 A $2 million-plus commitment to establish and fund a faculty chair for Stevens' growing Department of Computer Science, a chair named for Farber and his wife, who passed away in 2010. Farber will give $100,000 annually to create and fund the chair, and eventually convert his gift to an endowment that perpetuates the chair indefinitely. David Farber, Professor of Computer Science at the University of Delaware, has been known to utter strange and wondrous remarks, which his students have dutifully recorded. Filling a much needed gap. Electrons know neither morals nor boundaries. 3/2019 Keio University decided to interview me and had a professional writer prepare a four part biography with photos. http://www.kgri.keio.ac.jp/en/index.html Ps it is also available in Japanese. His and her excellencies, Paul Madden, British Ambassador to Japan, Yaffa Ben-Ari Ambassador of the state of Israel to Japan , Ambassador to Japan from the theRepublic of Indonesia, Joseph Young, Deputy Chief of Mission, U.S. Embassy Tokyo, Mr. Ikuo Misumi, Deputy Director-General, National center of Incident Readiness and Strategy for Cybersecurity, Mr. Yasuhiko Taniwaki, Vice-Minister for Policy Coordination (International Affairs) Ministry of Internal Affairs and Communications, Dr. Hiroshi Ito, Deputy Director-General for Cybersecurity and Information Technology at Ministry Of Economy, Mr. Hiroaki Nakanishi, Executive Chairman, Hitachi, Ltd, distinguished guests, ladies and gentlemen. Artificial intelligence which is making rapid advancements fueled by deep learning technologies, IoT,which is connecting not just computers, but every objects, and other information technologies are far more than being useful tools and are changing the fundamental nature of societies. With the recognition that the impact is sufficiently large to call it an emergence of a new civilization, Keio University is establishing Keio University Cyber Civilization Research Center in our Global Research Institute which is directly under the headquarters. We have just appointed renowned professors in the field Professor David Farber and Professor Jun Murai to be the co-directors of the center. Cybersecurity is an important element in making the emerging civilization to be truly benefitial to the human kind. In narrower sense, it may be about protecting systems from attacks and disasters. More importantly, however, cyber security is about building a society in which there are system-to-system, people-to-people, and ultimately people-to-people trusts. Existence of such trust will be a solid foundation on which the technologies bring happiness to people. In other words, cybersecurity research is about the creation of cyber civilization that brings happiness to every human being. We feel honored that Keio University can provide venue for the discussion of such an important topic and wish that you will have a very productive meeting. Before David J. Farber was chief technologist at the FCC from 2000-01, he was, literally, one of the people who laid the groundwork for today’s Internet. If Vinton Cerf and Robert Kahn are considered fathers of the Internet, then Farber is the grandfather. He’s also among those who think the FCC got it wrong. 2013 Talk "What the hell is the Internet and what is going on?" Hardware, software, and networks are all involved so there is no effective way to make a computer secure. Protocals, buffer bloat, bandwidth problems in the network are the next big problem facing the U.S. We should go back to fast circuit switching but who knows? The protocal we use now probably won't go into the future. 2013 Dave Farber, Internet’s “Grandfather,” Seeks to Cut Through Fog of Cyberwar Farber warned that that many "solutions" to cybersecurity, especially those offered by commercial firms, are bogus. He compared the escalating threat of cyberattacks to the nuclear arms race that followed the end of World War II. Farber said that, just as prominent physicists once led efforts to contain the risks of nuclear weapons, so should leading computer scientists help devise policies to reduce the risks of information technologies. Farber’s greatest concern is cyberattacks not by nations but by freelance criminal hackers. Farber feared that "the problem of hackers for hire is going to get maybe worse, because we are graduating kids who can’t get decent jobs but are well trained." He also has concerns about digital privacy as well as security and suggested that if Senator Joe McCarthy, who led anti-communist “witch hunts” in the 1950s, had had "the tools we have now, he wouldn’t have to say, 'Somebody said you met with…' He would just be able to say, 'You wrote this note to this guy 10 years ago.'" This was the first U.S. university to require students to purchase and use personal computers. A Stevens graduate created the IMAP email protocol that allows email to be sent and received by users of different machines, languages and operating systems worldwide. Hundreds of Stevens alumni sit as chief technology officers and other top executives of some of the world's largest finance, medical and technology firms. Only one man, however, answers worldwide to the moniker "Grandfather of the Internet" — a nickname earned for a career spent writing code and building the “backbone” that makes Internet search and communication possible today. And he, too, graduated from Stevens. Now David Farber '56, M.S. '61, is giving back in dramatic fashion to ensure that future generations of Stevens students will create the next computing breakthroughs through donation of a new faculty chair in Stevens’ Computer Science Department. Farber, now living in the Philadelphia area, grew up in Jersey City, Union City and Saddle River, all in N.J., and attended Stevens because he liked the looks of its engineering programs. "My father and I used to go into [New York] City often to buy electronics parts and build AM radios and other things," he recalls of his youth. "That's really where my interest in technology began." At Stevens he studied electrical engineering and mathematics, taking a fateful internship in Washington, D.C., the summer following his junior year. "I was working with the fellow who built the first transistorized analog computer," says Farber. "It was a phenomenal opportunity." While there, he computed the flow of neutrons in nuclear reactors. Dave always asks and likes to learn :-) a true teacher! 100 as one of the visionaries of the field and in the 1999 Network World as one of the 25 most powerful people in networking. In 2002 he was named by Business Week as one of the top 25 leaders in E-Commerce. Interim board of directors of the Broadband Internet Technical Advisory Group, Inc. (BITAG). A brief explanation of the "Grandfather"
David J. Farber was the Alfred Fitler Moore Professor of Telecommunications at the University of Pennsylvania, holding appointments in the Departments of Computer Science and Electrical Engineering. He recently served as the Chief Technologist for the Federal Communications Commission. Professor Farber was responsible for the design of the DCS system, one of the first operational message based, fully distributed systems and is one of the authors of the SNOBOL programming language. He was one of the principals in the creation and implementation of CSNet, NSFNet, BITNET II, and CREN. He was instrumental in the creation of the NSF/DARPA funded Gigabit Network Test bed Initiative and served as the Chairman of the Gigabit Test bed Coordinating Committee. His background includes positions at Bell Labs, the Rand Corporation, Xerox Data Systems, the University of California at Irvine, and the University of Delaware. Dr. Farber was appointed by President Clinton in 1998 to serve on the U.S. Presidential Advisory Committee on Information Technology. In addition, he is a Fellow of the IEEE and serves on the Board of Directors of both the Electronic Frontier Foundation and the Internet Society. He was a 10 year alumnus of the Computer Science and Telecommunications Board (CSTB) of the U.S. National Research Council and is a Fellow of the Japan Glocom Institute and of the Cyberlaw Institute. Dr. Farber was recently named one of the 25 most powerful people in networking in the January issue of Network World. He also served as an expert witness in the Microsoft antitrust trial. Unquestionably, Dr. Farber's lifetime significant pioneering work in telecommunications and his vision of electronic communication, will impact the world in the 21st century. Prof. Farber is the Alfred Fitler Moore Professor of Telecommunication Systems holding appointments in the Computer and Information Science Department and of the Electrical Engineering Department at the University of Pennsylvania. In January 2000, he was appointed to be Chief Technologist at the US Federal Communications Commission while on leave from UPenn. His term ended in January 2001. At UPenn, he is Director of the Distributed Computer Laboratory - DSL where he manages leading edge research in High Speed Networking. Research papers of the DSL are available in its electronic library. He also directs the Center for Communications and Information Sciences and Policy. His early academic research work was focused at creating the worlds first operational Distributed Computer System -- DCS while at the ICS Department at the University of California at Irvine. After that, while with the Electrical Engineering Department of the University of Delaware, he helped conceive and organize CSNet, NSFNet and the NREN. He graduated from the Stevens Institute of Technology in 1956 and then started a eleven year career at Bell Laboratories where he helped design the first electronic switching system - the ESS as well as helping to design the programming language SNOBOL. He then went west to The Rand Corporation and to Scientific Data Systems prior to joining academia. At both Bell Labs and Rand, he had the privilege, at a young age, of working with and learning from giants in our field. In 1999, he was awarded the honorary degree of Doctor of Engineering from the Stevens Institute of Technology where he also serves as a Trustee of the Institute. Director of the Electronic Frontier Foundation -- the EFF and a member of the Board of Trustees of the Internet Society -- the ISOC. Visiting Professor of the Center for Global Communications of Japan -- Glocom of the International University of Japan, a Senior Fellow at the ASIA NETWORK RESEARCH in Malaysia and a Member of the Advisory Board of the Center for Democracy and Technology - CDT. Just completed 10 years of service on the National Research Council's Computer Science and Telecommunications Board -- CSTB. Served on the Presidential Advisory Board on High Performance Computing and Communications, Information technology and the Next Generation Internet until his appointment to the FCC. A Fellow of the IEEE and was the recipient of the 1995 Sigcomm Award for life long contributions to the computer communications field. Awarded in 1997 the prestigious John Scott Award for Contributions to Humanity. Named in the 1997 edition of the UPSIDE's Elite 100, as one of the Visionaries of the field and was named in the 1999 Netword World as one of the 25 most powerful people in Networking. His industrial experiences are extensive. Just as he entered the academic world, he co-founded Caine, Farber & Gordon Inc. (CFG, Inc.) which became one of the leading suppliers of software design methodology. He is also on a number of industrial boards. I could retrieve my email, however, and my inbox over­flowed with useful news from Dave Farber, one of the new breed of editors. Then a telecommunications professor at the University of Pennsylvania, Farber had a mailing list called “Interesting People”30 that he'd run since the mid-1980s. Most of what he sent out had first been sent to him by correspondents he knew from around the nation and the world. If they saw something they thought he'd find interesting, they sent it along, and Farber relayed a portion of what he received, sometimes with his own commentary. In the wake of the attacks, his correspondents' perspectives on issues ranging from national-security issues to critiques of religion became essential reading for their breadth and depth. Farber told me later he'd gone into overdrive, because this event obliged him to do so. Dave Farber still makes these choices on the IP list. It's still a must-read source of news and wisdom for me and the legions of people who continue to follow this particular wire service. The value of this service — we now tend to call it curation and aggregation — wasn't as clear a decade ago as it is today, however. Dave was invited to give a Key Note at the second Russian IGF conference - a conference of those involved in the Russian Internet and its governance. In addition he was asked to give a lecture at the Higher School of Economy's (HSE) Department of International Studies. A point he made is that it is counter productive to use the term -- Network Governance such as ICANN uses rather than Network Management and that it is highly unlikely that anyone can “shut down” the net like the Russian Duma folks seems to think Obama can do. He did a number of interviews for magazines (including the VOA) and a TV program – Channel 2. All are available on request in Voice of in Russian or translated by Google (sometime humorous). The FCC's new chief technologist is trying to untangle the agency's massive legacy of regulation to help the Internet grow. He's got a few things to learn. By Aaron Pressman Dave Farber, internet pioneer and University of Pennsylvania computer science professor, came to Washington in January to be chief technologist at the Federal Communications Commission. Farber figured he could teach the bureaucrats a few things about the Net. It turns out he had a few things to learn about politics. I have now been in Washington for five months. I feel like a veteran Washingtonian -- even an inside the beltway figure. This is the first in a set of diary entries addressed to the important issues facing the government, public and industry in cyberspace and what I have a learned about the Government in general and the regulatory bodies in specific. While I promised not to keep disclaiming, in this report I must emphasize that this certainly is not the FCC speaking nor any of the Commissioners -- just Dave Farber. First the FCC, The attitude at the FCC is very much to loosen regulation on traditional services; to encourage the exploration of new services on established systems and to count on market forces to control competition and drive prices down. Sounds great and works rather well in a competitive market place -- like cellular and long distance. In the Internet space, the attitude of Washington outside the Congress is "we don't understand it and lets leave it alone" [ at least till they understand it better :-) ]. Again it is very much , "let market forces do the regulation". I have a big problem with this strategy. not that I like the other obvious one any better -- namely regulate, My concern is centered around the question of whether in a dynamic field such as the Internet where technology drives it fast -- can the reliance on market forces work to avoid damaging our citizens. The center of the issue is whether by the time you determine that there has been a failure of market forces, will it be too late to correct things. Counting on such slow acting forces such as regulation and anti-trust will leave dead bodies and bankrupt companies and dominant players either slowing innovation or controlling price/service. A case in point is Microsoft, IF the government contention is upheld, we have a case where clearly market forces did not work, where many hopeful competitors are dead and where even after the proposed breakup, the established customer base and startup nature of real competition will still give Microsoft a big edge. I should have said early on I am not a trained economist. I am a scientist and a entrepreneur so my terms may be incorrect in economic theory but are the ideas right? So what can be done. Real hard! I can give you a set of future scenarios which would make the Robber Baron's envious. The only way I can see out of this is for the Government to establish a set of trip wires that define the boundaries of acceptable behavior. The purpose of the trip wires is not to just constrain behavior but to help companies not to trespass on dangerous ground. Without such understood trip wires no one knows when they go to far. How are these trip wires articulated, not in private negotiations but in very public speeches by , in the FCC case , the Commissioners and senior staff. In many ways this reminds me of Herman Kahn at the RAND Corp in his books on Thinking the Unthinkable -- on Thermonuclear war. Herman was endlessly criticized for daring to think of thermonuclear war. His comment was it was the highest form of irresponsibility not to understand the steps involved so you had an understanding of what actions would result in -- hundreds of millions of dead. I believe Herman helped to stop nuclear Armageddon. The analogy in this case is there is no Herman Kahn (I am just a learner) who has articulated future scenarios and established based on the analysis of these scenarios, where the trip wires are and what are reasonable directions. Example, would a duopoly that controls data access to homes control path and content be acceptable? Would an equivalent of the ALLEGED behavior of MS mapped over to the communications field be acceptable? What are the scenarios that would allow this to happen and how realistic are they and where to be put the tripwire such that we can detect problems before it is too late and what do we then do. Boy, it was easy in the old days when progress was slow and you had time to react and patch prior to a rip in the economic fabric -- not now people!! In the next Diary entry -- will security issues sink the internet into regulation (hint my call is yes). CONSIDER the recent string of electronic events: A virus that becomes known as the love bug causes nearly $1 billion worth of damages as it ravages computer systems across the world. The Office of National Drug Control Policy admits that it may have violated federal privacy guidelines by implanting software on the computers of its Web site visitors that tracks their travels across the Internet. Hackers seize control of Nike's corporate Web site to announce that "global justice is coming -- prepare now." "The Net's going to go fumbling along until there's a massive intrusion," said Dave Farber, an Internet pioneer and chief technologist for the Federal Communications Commission. "Then everything will hit the fan. Congress is going to go ballistic, and we're going to panic our way into doing something." He added, without much hope, "It would be much nicer to start talking about it now." The technological roots of the Internet's vulnerability are well known. Conceived by the Defense Department as a decentralized communications system that would continue to function even if chunks of it were destroyed, the Internet is by its nature open and interconnected. "The Internet was built in an age when we all knew each other, we all trusted each other, we were talking about where to have dinner and what silver futures to buy," said Mr. Farber, speaking of the scientists who built it. "Now we've moved it into an environment where the country counts on it. And it's very hard to retrofit security." "The opportunity for things to go wrong is always increasing," said Robert Morris, an assistant professor of computer science at the Massachusetts Institute of Technology who is perhaps better known as the creator of the first Internet worm, which crippled the network in 1988. "More people are also going after things. But it's not clear who's going to win, the people who write software with bugs or the people trying to fix the bugs." There are two areas of attack on the Internet. The first and the one we primarily have seen are primarily attacks on the user and server software. They will always be subject to what one could call the ECM turnstile. We will get attacked and the software will be fixed and the attackers will search for new vulnerabilities and we will get hit and fix those and it will be a endless round and round. Proper attention to correct security design in new products would help a lot. Better hardware systems to ensure the ability to build secure software will help. Bob's concerns address this point. What I worry about is that future and maybe current attackers will not be high school kids but very smart and with it professionals with a cause. I am a lot more worried by attacks on that part of the Internet that lies in its arterial structure -- namely the set of protocols and software that control the routers and traffic systems of the core internet. Much of the protocols were designed in those happy old days (well reasonably happy). I and others I have spoken to have little confidence that there are not a number of interesting attacks which can do a number on the internet communications system with result similar to the failure of the SS7 part of the POTS network (not the same causes). We also may be constructing a commercial environment which is very vulnerable to reliability failures due to limited peering relationships. I for one would like to understand just how solid or vulnerable we actually are so we can fix it and as we fix it we can tell senior policy makers and the congress what the true state of the net is. Published in the Australian Financial Review reporting on a talk I gave at the First Tuesday meeting in the new IT/residential complex being developed in the Gold Coast in Queensland Australia on 4 Nov 2001. Caritas Technologies, Inc. has been awarded U. S Patent No. 6,072,780, with twenty-six claims on an application originally disclosed in August, 1996, entitled "Dial Up Telephone Conferencing System Controlled by an Online Computer Network". Dave is one of the inventors. Jonathan B. Postel Internet pioneer in charge of the first domains, that he kept in a drawer. "Be liberal in what you accept and conservative in what you send." 10-year anniversaries of experiments in the evolution of the broadband Internet, starting 5/6/93 The Aurora collaborators were Bell Atlantic, Bellcore, IBM, MCI, Nynex, U. arizona and U. Penn. The effort was part of the Gigabit Network Project conceived by Dave Farber and Bob Kahn and funded by Darpa and the NSF. Webcast "The Secure All-Optical Internet of 2010 -- What are the key open research questions". given at the Hawaii International Conference on System Sciences this Jan in Kona, Hawaii. The introduction was given by John Seely Brown. The United States has gone through a roller coaster in the balance between individual freedoms and national safety throughout its history. As usual in a capitalistic democracy, profits, immigration, and other societal pressures have all factored in to the challenge. After the tragic attack on September the 11th, the Bush administration has called for, and received, increased powers to listen to our conversations, look at our e-mail, and see who and where we visit in cyberspace -- all with the stated intentions of protecting us from terrorists. Even prior to 9/11, repeated calls for increased powers for law enforcement resulted in ill-thought-out or rushed ideas such as Clipper -- the key escrow proposals of not many years ago -- and hastily adopted, potentially destabilizing schemes such as the Carnivore e-mail monitoring system. Now more than ever, the technical community has a vital role in maintaining the balance. He is known as the "Father of the Internet" since he and Robert Kahn co-designed TCP/IP protocols and the Internet's basic architecture.